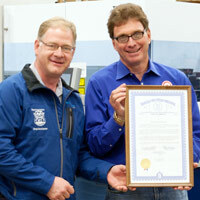 Industrial Magnetics, Inc. - Governor Rick Snyder Awards Special Tribute to Industrial Magnetics, Inc. Governor Rick Snyder Awards Special Tribute to Industrial Magnetics, Inc.
Home / Company Information / Press Releases / Release: Governor Rick Snyder Awards Special Tribute to Industrial Magnetics, Inc.
For Immediate Release: Posted On 5/9/2011 By Industrial Magnetics, Inc.
Industrial Magnetics, Inc.(IMI) of Boyne City, MI recently received a special tribute from Michigan Governor Rick Snyder, State Senator Howard Walker, and State Representative Greg MacMaster commemorating their 50 year anniversary in 2011 as a Michigan manufacturer of magnetic components and assemblies. State Representative Greg MacMaster, who presented the tribute at Industrial Magnetics, expressed gratitude to the staff and management of IMI for all they’ve contributed to Boyne City and to Michigan and wished them well in the years to come. About IMI: Industrial Magnetics, Inc. has served the industry since 1961, providing innovative permanent magnet and electromagnetic devices to meet customer’s specific requirements in magnetic separation, automated material handling and holding, lifting, or fixturing applications.